Fucked-up is the new fleek. The concept of the trend—a similar style vein running across multiple brands—might be on its deathbed, where its been laying for the past several years, but this past fashion month designers were on the same page at least when it came to beauty looks. On that front, fashion toughened up for fall. Tattoos, face charms, and subversive face painting dominated in the makeup department, with designers relying on everything but the clothes to add edge to their highly salable collections. Consider it a reaction to normcore, or fatigue over the pastel parade of the last few seasons, or a natural evolution of the septum piercings that were favored by so many pop culture figures last year like Rihanna, FKA Twigs, Zoë Kravitz, Lady Gaga, and Katy Perry, but facial mutilations were impossible to overlook this past fashion month. You couldn't even escape them in the crowd, where A$AP Ferg tried out a full face tattoo in the front row at Adam Selman and, later, wore warrior paint to Pyer Moss. To help you sift through the extreme variations, we rounded up the designer's that have taken on facial mutilations. If anyone in fashion has a claim to facial mutilations, it's Riccardo Tisci who championed doorknocker-size septum piercings back in 2012. Since his couture collection of that year, the accessory has been seen everywhere from Claire's to on Jessica Biel. So when Tisci took on the look again for fall, he dialed it up. What resulted was a zit-like breakout of baubles. 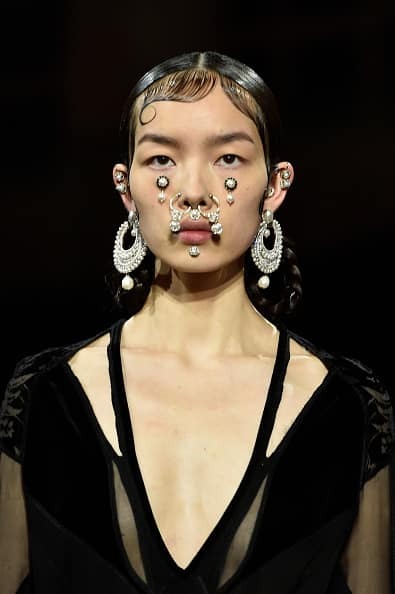 Tisci morphed preppy pearls into near-grotesque inner-earrings, cheek piercings, and even teardrops. The beauty look at John Galliano's ready-to-wear debut for the newly rebranded Maison Margiela was just as strangely alluring. 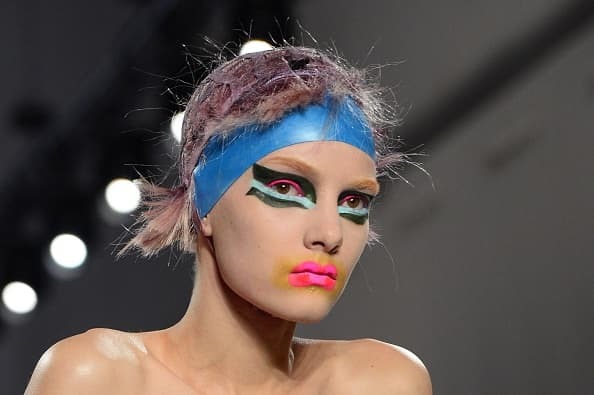 Ugly was in as the former Dior head masked models in clown-like makeup, raggedy wigs, and hunchbacks. Did the designers behind Rodebjer, Giamba, and Anthony Vaccarello pin pictures of Lil Wayne's new face tattoos to their moodboards for fall? Possibly, though it seems far more likely that the three brands were just building on an ink movement that had been bubbling up over the past several years with Tommy Hilfiger adorning Kendall Jenner with tattoos for spring, Marc Jacobs recruiting tattoo artist Scott Campbell to put his stamp on Louis Vuitton's accessories in 2010, and Chanel making tattoo jewelry in 2009. This season, designers fully committed to the tattoo trend, taking it to the face: Rodebjer with crescent forehead tattoos, Giamba with constellation-like designs, and Anthony Vaccarello with zig zag eyeliner. 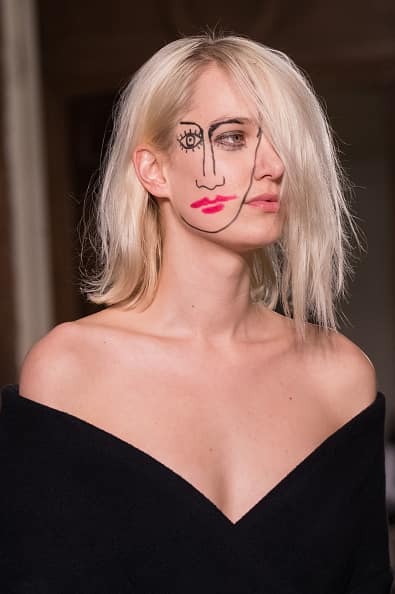 Meanwhile for Simon Porte of Jacquemus, face art was much less permanent—and much more artful. The 25-year-old French designer channeled Picasso through makeup with surreal trompe l'oeil drawn-on faces that perfectly overlapped with models' features. Porte also coined a new kind of makeup with outlines of tank tops painted above models' bare breasts. Rick Owens might have had the most unforgettable facial art of all. Though the designer didn't come up with anything that was as much of a talking point as his NSFW peek-a-boo men's looks, the facial decorations on his female models were just as mesmerizing—granted, in a different way. 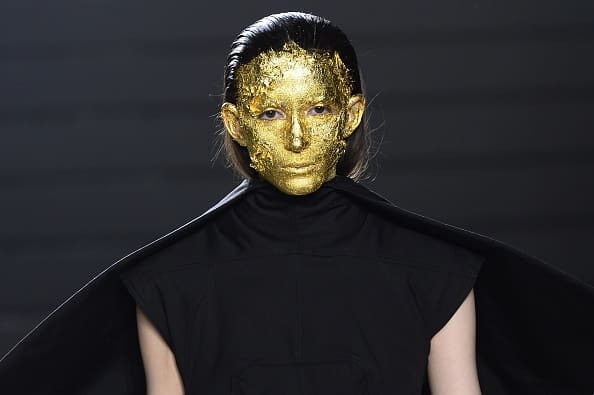 They were shinier for one—inspired by "Mayan goddesses," Owens sent models down the runway plastered with gold leaf that took an hour and a half to apply. It's not exactly attainable outside of the runway, but it's definitely memorable.